You love your West Linn football, right? Don't worry — we know you do. And because we know, we have just the thing for you — consider it your first Christmas present. It's every West Linn football story of the year and every photo to go with them. See below for a story-by-story, week-by-week walk through the 2018 season with the mighty Lions. For the first time in what seemed like a long time, West Linn was not the premier team in the Three Rivers League in 2017. The Lions, after finishing second in the state in 2015 and winning their first Class 6A state championship in 2016, took third in the TRL last fall and eventually bowed out in the state quarterfinals. While those results might represent a great year for other teams, West Linn has set the bar higher than that and the Lions are determined to get back to the top in 2018. From the outside looking in, it was obvious — the West Linn football team was done. The Lions — facing Central Catholic in both teams' opener at Hillsboro Stadium on Friday — had blown a 19-point lead, saw the Rams pull ahead by eight points in the fourth quarter then punted the ball away on each of their first two fourth-quarter possessions. But West Linn's defense stepped up when it absolutely had to, the Lions' offense tied the game late in the fourth quarter, and finally, West Linn got one more stop in overtime and won the contest 47-41 on senior running back Dawson Jolley's 25-yard touchdown burst. 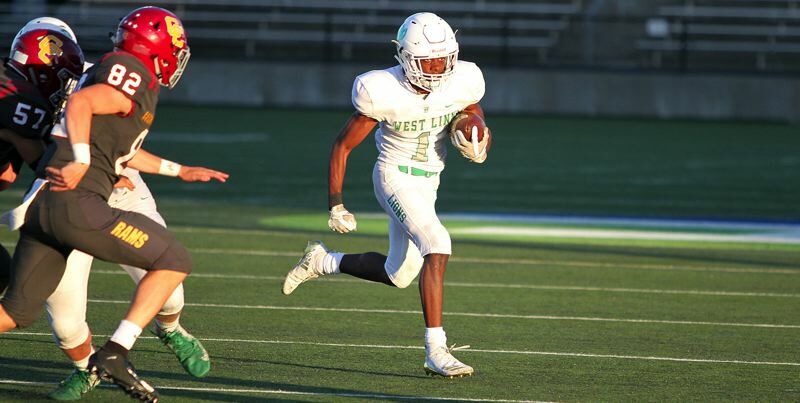 Each week poses a new test in Oregon high school football, but so far, the West Linn football team is passing with flying colors. The Lions, who hosted McNary on Friday at West Linn High School, scored early, scored often and just kept scoring until they put the Celtics away 55-27. Another week, another killer opponent for the West Linn football team and another chance for the Lions to prove themselves and get better. West Linn, playing at Sheldon in non-league action on Friday night, traded punches with the talented Irish all night and trailed by just two points at the end of the third quarter before finally falling 42-27 in a game that saw starting quarterback Ethan Long knocked out of commission with an ankle injury. The West Linn football team was, admittedly, not at 100 percent on Friday night against Lakeridge. Senior quarterback Ethan Long had spent part of his week in a boot after suffering an ankle injury against Sheldon a week earlier. Senior running back Dawson Jolley — the team's leading rusher — missed the game with a concussion. So how did the Lions respond? They forced five Lakeridge turnovers, fought off a determined Pacer challenge and pulled away to win their Three Rivers League opener 45-28 at West Linn High School. The West Linn football team, it turns out, is again among the state's best teams. In the latest Class 6A statewide coaches poll shared on the Oregon School Activities Association website on Tuesday, West Linn is seventh in the ranking of the state's top 10 teams. Sherwood thrived on it for most of the contest. But at the end, West Linn showed it could play some hard-nosed football of its own. The West Linn football team may have struck first Friday, but Lake Oswego struck back — and struck back hard. It was a day for defense. On a day when the Tigard football team's offense managed just one first down in the opening half, the Tigard defense stepped up. The Tigers picked off five West Linn passes on Friday night, got three field goals from junior Jackson Cleaver and used those to power its 23-21 victory at West Linn High School. It's almost time to kick off the 98th iteration of the West Linn vs. Oregon City high school football rivalry. But first, the Optimists Club of Oregon City is inviting the public to attend a breakfast on Tuesday, Oct. 23, at the Oregon City Elks Club to preview the annual "Battle for the Bridge" contest. At 7 p.m. Friday, West Linn will face one of the state's marquee programs — No. 3 Sheldon — at Sheldon High School with a state semifinal berth on the line.